Togakushi Shrine Chusya (戸隠神社・中社) is the center shrine of Five Togakushi Shrines. It was built in 1098. 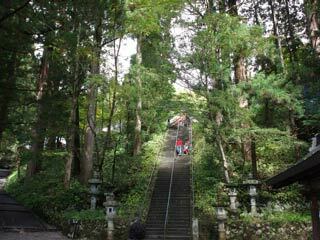 Togakushi Shrines were originally built as temple of Sugen-do in 849. Chusya is located in the center of Togakushi area, and it has many huge cedar trees which also considered as the sacred trees which gives visitors a power of nature. Sanbon Sugi: over 900 year-old Cedar Tree. The god of this shrine produced the dance and music when Amaterasu Omikami was hidden in the rock. Therefore, this god is considered as the god of knowledge and arts.